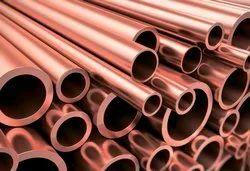 Cu-Ni cupro nickel Pipes & Tubes 90 -10 & 70-10. We bring forth to our clients Nickel 90/10 Non Ferrous Cupro, which is developed under the stern vigilance of our specialist professionals who have affluent industry experience in this domain. Our experts make use of avant garde technology and quality materials in order to produce this product. Our offered product is tested accurately by our quality checkers in order to ensure the quality of the product. Moreover, our clients based across the national market extensively acclaim this product.